Stem cell stories that caught our eye: new CRISPR fix for sickle cell disease, saving saliva stem cells, jumping genes in iPSCs and lung stem cells. The CRISPR-based gene editing technique has got to be the hottest topic in biomedical research right now. And I sense we’re only at the tip of the iceberg with more applications of the technology popping up almost every week. Just two days ago, researchers at the Dana Farber Cancer Institute in Boston reported in Nature that they had identified a novel approach to correcting sickle cell disease (SCD) with CRISPR. 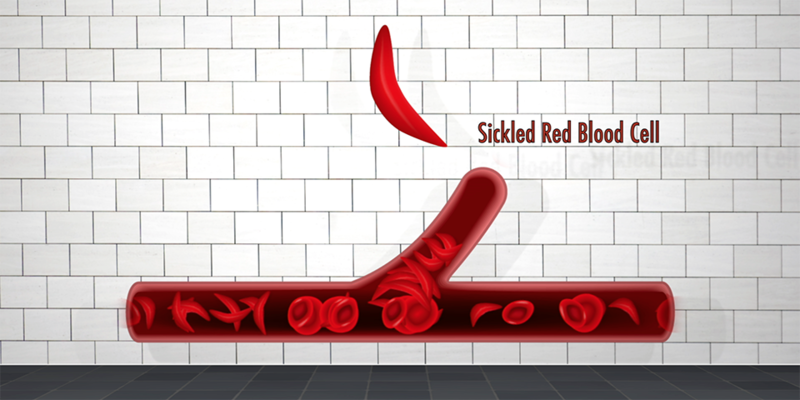 Sickle cell anemia is a devastating blood disorder caused by a single, inherited DNA mutation in the adult form of the hemoglobin gene (which is responsible for making blood). A CIRM-funded team at UCLA is getting ready to start testing a therapy in clinical trials that uses a similar but different gene editing tool to correct this mutation. Rather than directly fixing the SCD mutation as the UCLA team is doing, the Dana Farber team focused on a protein called BCL11A. Acting like a molecular switch during development, BCL11A shifts hemoglobin production from a fetal to an adult form. The important point here is that the fetal form of hemoglobin can substitute for the adult form and is unaffected by the SCD mutation. So using CRISPR gene editing, they deleted a section of DNA from a patient’s blood stem cells that reduced BCL11A and increased production of the fetal hemoglobin. This result suggests the technique can, to pardon the football expression, do an end run around the disease. Whatever the case, we’re big believers in the need to have several shots on goal to help ensure a victory for patients. Clinical trial asks: does sparing salivary stem cells protect against severe dry mouth? I bet you rarely think about or appreciate your saliva. But many head and neck cancer patients who undergo radiation therapy develop severe dry mouth caused by damage to their salivary glands. It doesn’t sound like a big deal, but in reality, the effects of dry mouth are life-changing. A frequent need to drink water disrupts sleep and leads to chronic fatigue. And because saliva is crucial for preventing tooth decay, these patients often lose their teeth. Eating and speaking are also very difficult without saliva, which cause sufferers to retreat from society. Help may now be on the way. On Wednesday, researchers from University of Groningen in the Netherlands reported in Science Translational Medicine the identification of stem cells in a specific region within the large salivary glands found near each ear. In animal experiments, the team showed that specifically irradiating the area where the salivary stem cells lie shuts down saliva production. And in humans, the amount of radiation to this area is linked to the severity of dry mouth symptoms. Doctors have confirmed that focusing the radiation therapy beams can minimize exposure to the stem cell-rich regions in the salivary glands. And the research team has begun a double-blind clinical trial to see if this modified radiation treatment helps reduce the number of dry mouth sufferers. They’re looking to complete the trial in two to three years. Believe it or not, you have jumping genes in your cells. The scientific name for them is retrotransposons. They are segments of DNA that can literally change their location within your chromosomes. While retrotransposons have some important benefits such as creating genetic diversity, the insertion or deletion of DNA sequences can be bad news for a cell. Such events can cause genetic mutations and chromosome instability, which can lead to an increased risk of cancer growth or cell death. To make its jump, the DNA sequence of a retrotransposon is copied with the help of an intermediary RNA (the green object in the picture below). A special enzyme converts the RNA back into DNA and this new copy of the retrotransposon then gets inserted at a new spot in the cell’s chromosomes. Most of our cells keep this gene jumping activity in check by adding inhibitory chemical tags to the retrotransposon DNA sequence. Still, researchers have observed that in unspecialized cells, like induced pluripotent stem (iPS) cells, these inhibitory chemical tags are reduced significantly. So you’d think that iPS cells would be prone to the negative consequences of retrotransposon reactivation and unleashed jumping genes. 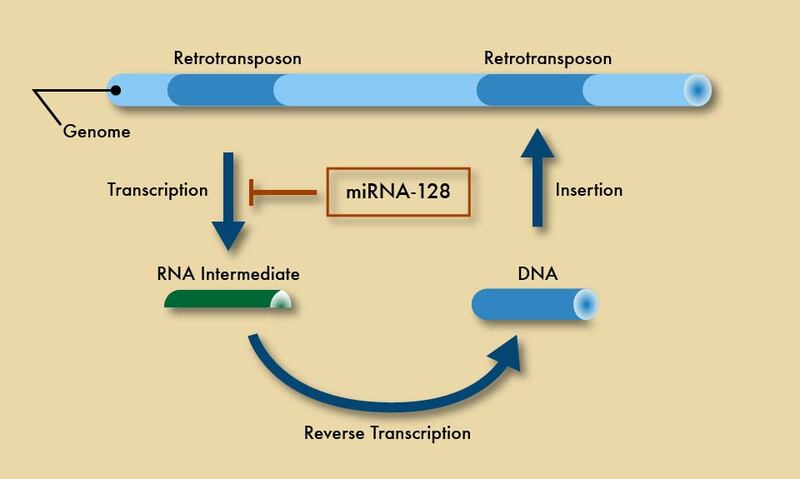 But in a CIRM-funded paper published on Monday in Nature Structural and Molecular Biology, UC Irvine researchers show that despite the absence of those inhibitory chemical tags, the retrotransposon activity is reduced due to the presence of microRNA (miRNA), in this case miRNA-128. This molecule binds and blocks the retrotransposon’s RNA intermediary so no duplicate jumping gene is made. The team’s hope is that by using miRNA-128 to curb the frequency of gene jumping, they can reduce the potential for mutations and tumor growth in iPS cells, a key safety step for future iPS-based clinical trials. Chronic lung disease is the third leading cause of death in the U.S. but sadly doctors don’t have many treatment options except for a full lung transplant, which is a very risky procedure with very limited sources of donated organs. For these reasons, there is great interest in better understanding the location and function of lung stem cells. Harnessing the regenerative abilities of these cells may lead to more alternatives for people with end stage lung disease. In a BioMedicine Development commentary that’s geared for our scientist readers, UCSF researchers summarize the evidence for stem cell population in the lung. We’re proud to say that one of the lead authors, Matt Donne, is a former CIRM Scholar.